Walking around the rue du Bailli in Brussels, I came across a little bookshop near the church, called "Peinture fraîche" - in it, a whole different world of primarily photography, architecture and art books. It was there that I discovered Introduction à la culture japonaise by Hisayasu Nakagawa and I just had to buy it. I have more often than not bought a book because of the bookstore, and I've yet to be dissapointed. The originality of the book is that it is actually written in French, not Japanese. The author, a Japanese having studied and lived in France (specialising in Diderot and Rousseau), has the ability to understand both worlds so well, that he can provide examples and definitions to us Westerners to all "different" ideas of Japan. The purpose, according to the author, is to prove exactly that Japan is just a different culture and not something exotic. The book itself is small - 100 pages - and is furthermore split in chapters covering the various main ideas, making reading it very easy. The author's personal experience and evidence in the situations described further enhances the readability - I particularly liked the difference between "I" and "we" as well as the religion split. In the end, I may not be in a position to view the world like a Japanese, but I can say that I know why there are these essential differences between the two cultures. I found the book to be intelligent, not only in terms of me understanding a different culture, but also in learning about my own, as it is seen by others. I absolutely loved the method of narrating through exchange of letters and telegrams, if only for being able to read instalments without losing the context. Even though this method can be considered dated, it does bring back happy memories, when people took the time to put their thoughts into paper - the use of language is very important and I feel that our time does not make enough use of this. (Could this story be told through texting? I don't think so!). It's set in a very romantic environment, where people with destroyed houses are still looking to gather coupons to buy luxury items, and travel to nearby islands. The story of Guernsey itself I found most intriguing. I would never have guessed that they, too, would be under occupation during the WWII, but I was wrong. The description of children being sent away to the mainland and of islanders trying to make do with whatever was left does still provoke a nauseating feeling. I was also surprised at the reality these islanders faced: shunned by mainland Britain, occupied by Nazi Germany, they truly were left on their own to survive. Two twists in the story kept my interest up high throughout the book: the reference to the Brontës, especially Anne (who is my favourite), and Oscar Wilde. I just loved the fact that in a book that is meant to attract a modern audience, the main character has actually written a book on Anne Bronte and further makes comments on the whole family. The whole incident was just too intriguing to miss. And then the letters sent by Wilde to an islander? Excellent trick - where there would just be a mediocre author trying to overcome a writer's block and an island that has no great interest, this book has managed to provide just enough spark to light up the story. The references also to other books and authors, courtesy of the island's literature society, also provide inspiration to look them up and read. In reading about the book, I came across reviews by present-day islanders, who were not pleased about the depiction of the characters living there. I have never been to Guernsey, but I've travelled to a lot of islands. It is a fact that an island, because of its specific characteristic, is a microcosm that will include all the types of personalities one meets in a society - just in this case, they are all very close to each other. I cannot say that it bothered me, or that I thought bad of the place - I am all too well aware that a balanced society will have to accommodate all types and make use of them. Could this story find its way in our modern-day reality? Probably not. Yet, this book shows the adventures of the common man, who, while not making headlines, proves to be as exciting under the surface as the known "celebrities". And this should be an inspiration to all. Don't mind me, I'll just keep on participating in more challenges for 2012... I'm looking forward to starting the Back to Classics challenge hosted by Sarah reads too much. Weird title, isn't it? At least that's what grabbed my attention while looking for holiday reading at a bookstore. Part of the "No. 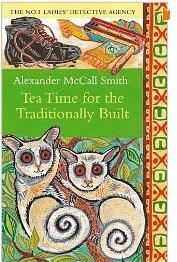 1 Ladies Detective Agency" series, Tea Time for the Traditionally Built, by Alexander McCall Smith, promised to be a nice, gentle, fuss-free reading. And it didn't fail. Set in a dreamy Botswana, the book follows Mma Ramotswe, a tea-loving and "traditionally built" private detective and the various "misfortunes" in her life, while trying to run her agency. I was immediately hooked on it, mainly because it's very easy reading, with emotions not running high (and which would upset me), and with a pace which, though slightly slow, is actually calming and enjoyable. There are various themes coming through the pages of this book (AIDS, differences between the sexes) that are still part of our lives. Yet, while they do play a role in the characters' lives, I found that the primary theme was the one on the goodness of people and on the ways to enjoy life. Mma Ramotswe is an example of this school of thought herself, managing to provide solutions to all problems in the end, while maintaining her good manners and politeness. This not a book that will trigger deep thoughts; it will leave, however, a feeling of thorough enjoyment. I wouldn't go as far as calling it "chick-lit", but its purpose is exactly the same: fill my reading time with a story that's captivating, sweet, carefree. A welcome break to be taken with tea and doughnuts. Again, there were adaptations: the first was an adaptation of Martha Stewart's recipe. Whereas I thought I had pistachios, I didn't, so I simply used pumpkin seeds instead (green as well...). And, obviously, I made them round and not triangles (I can be lazy sometimes...). Initial reactions at the party were positive to these batches, so World, be aware - there will be more cookie baking to come! The purpose of book clubs is to introduce us to books we would otherwise not even have looked at. Such was The Glass Castle by Jeannette Walls, the first book I would be reading for my book club. Just reading the back cover, I thought in dismay what nuisance this book would be. Another autobiography to bring us all to tears, I reflected (yes, I am that cynical). I was totally wrong. This is indeed a heartfelt, true story, of a thoroughly eccentric family in Appalachian America and how each of the members managed (or not) to overcome situations that most can only see in films. The descriptions in the book really shocked me, all the more because I still have an idealised version of how a family should function, where parents respect each other and provide and care for the children - nothing like two parents who, though they may love their children, are so self-absorbed that they play with the idea of pushing the author towards prostitution, they don't notice when she falls out of a moving car, just as they don't see a problem with the family living in extreme poverty (even though, towards the end of the book, we learn of an amazing fortune left unexploited). Still, the tone in the book is not about self-pity - surprisingly, the author describes all incidents in a neutral, balanced manner that lets the story tell itself. There is a lot of neglect but, most accurately put forward by the author, there is also a lot of complexity in the relationships within a family. While reading this book, I felt at times like a witness in a car accident - it's horrible, there's broken glass and blood everywhere and people have been injured, but I just can't help myself standing there watching. I wanted to see (read) more ugliness. The bad incidents are plenty in the life of the author, but of course, she and her siblings regard many of them as the usual way of things. And here I questioned myself: how do we judge a situation? what makes an incident horrible to a child, when the child itself does not regard this as such? Everything in life is so subjective, I truly believe the author went by her childhood without feeling sorry for herself for the ugliness she went through - on the contrary, she became an adult early on and learned very important survival skills that eventually helped her get away from home and thrive. So while three of the four children manage in the end to lead a "conventional" life, the parents sink even further, willingly continuing to rummage dumpsters and living an "unconventional" life. This was the part that was most difficult to comprehend and accept. My comfortable, unadventurous, traditionally-educated self made me want to shout at these characters (actually, I think I did at some point) with frustration : What is wrong with you people? How can you NOT want to escape this diresome existence? The Glass Castle is not a light story to read, but I'm glad the author decided to share it with us, if only to marvel at the strength of courage and determination in all of us, as well as the resilience against difficult situations. It's always about this time that I read books I normally don't have the time or the inclination to read. This time round, I came across Swell Holiday, by Ilene Rosenzweig and Cynthia Rowley. The first impression was that this book is a combination of chick-lit (certainly the format of the book!) and a guide to stress-free holidays. I know, there are plenty of books on how to organise for the holidays, I just find them too "stiff" for my taste. However much I enjoy the preparations, the cooking, the decorating and the giving and receiving of gifts, I do want to relax at the same time and just go with the flow... This is the main reason, I suppose, why I just loved this book. Part of the Swell series of books, it's addressed to everyday women who know how to live "swell", i.e. with a certain finesse... The book can be read within an afternoon, preferably with tea and scones, and manages to include within its pages tons of innovative ideas, without ever getting tiring. I absolute loved the tone in which the whole book is written, which made me feel as if I were in a conversation with friends. For gifts, for example, of the proposals were well thought out - things that do not need to cost much, but which would trigger a "wow" effect. At a time where everyone I know has everything, it really opened my eyes to the possibilities I still have to offer a special something to those I love. This book also made me realise that living the good life is not about the tangible goods one can have, but rather about paying attention to the little details in otherwise perfectly ordinary things in our lives. Our society has provided us with some much "clutter", that we sometimes accumulate quantities without ever thinking about quality. Quality that would demonstrate our individual taste and give that "va-va-voom" part to enrich our lives. Another point I found very interesting in this book, was how uncommon the proposals were, be it for gifts, for preparing for the holidays or organising parties. So little is required to make an event unforgetful, that I found myself reading in disbelief at how easily we can go beyong the bare minimum. At times of cautious living, I believe this book has served its purpose: providing "swell" advice, within budget, for an extraordinary time during the holidays. The other book I read was Murder on the Orient Express, by Agatha Christie. Now, I first have to admit that I have never read any of Christie's books. Ever. I simply enjoy the films so much, where apart from the mystery plot and my favourite heroes, I can also enjoy the scenery, the costumes, the houses and all the other details that, that I had never thought up to now to actually read how Christie had envisaged the story. But I recently watched the adaptation of the book with my favourite Poirot, David Suchet. And I was perplexed. I know that the production is one of the best ones to date, but why was it so different from the previous one with Albert Finney? I had enjoyed that film so much, that I could not believe that one of the two makes was unfaithful to the book. But which one was it? To answer it, I would need to read the book. So I started, and was impressed after only a few pages: The book reads very easily, making it ideal for tired, late-night escapades, or again for commute or vacation. The plot is very clever in its conception and the twists are unsurpassable (of course, I knew whodunnit, but I could still find little unknown details that kept me alert). It took me a whole two days to finish (...) but I never felt that the book was missing in substance or character. A great lady of mystery writing certainly does not need to go up to 700 pages to intrigue us. So, all in all I'm happy I found a new genre to read. I've the whole list now of her books and I can't wait to start reading those books I haven't seen in film. As to which adaptation of Murder is closer to the book? Both! I am an avid amateur cook, and must admit that I simply do not understand this trend. I suppose I never saw cooking as a skill to show-off, but rather an activity that comforts, soothes, and yes, feeds! After trying more than my fair share of cookery books, I now tend to look for authors who are of the same school of thought, and who have something new and interesting to show me. I can't remember when or where, but the minute I watched Yotam's video preparing aubergines, I somehow knew that he would change my perception of vegetarian dishes. I started looking more and more into his cooking and his book Plenty and became fascinated with the multitude of possibilities vegetarian cuisine can offer. When I then found out that he was himself not a vegetarian, I knew I had found the book for me. I first flipped through the book in London, but realising the weight it would have on me, preferred to order it online instead. I was in awe. I studied every page, and never lost interest. The format of having one recipe per page, most with photos, the split into sections (so that I can skip the mushroom one, for which I don't care), the variety of herbs and spices, all gave me plenty of food for thought! I will admit that it is primarily a Mediterranean -middle-eastern type of cuisine, but I personally love that taste, so no problem there! I have already made half of the recipes in the book, which is more than the recipes from half of the other cookery books I have. This goes to show that there are still authors out there who have something to say, and we should take the time to look out for them. As in literature, it is too easy to dismiss one whole type of activity (be it a literature genre, or - in this case - cookery) and to miss some real gems. Enjoy! The challenge is to read in 2012 one book in each of the categories. The books can be in any form, and may overlap other challenges but not the categories.